I wrote this when we lived in the apartment, but I am just now sharing it. It wasn’t that long ago though, so I’ll just leave the words as they were originally written. It feels offensive to even type that title. I am not in anyway trying to imply that my precious Savior belongs in the garbage. It’s an amazing paradox though. To think about how our awesome creator can be so holy, so sovereign and royal, and yet He sent His Son to come down to where we are and meet humanity in the depths of their desperation. How often did the Pharisees disapprove of who Christ was hanging out with or where he was hanging out because it seemed unclean to them? This has been on my mind a lot lately. We live in an apartment where some of our neighbors are abusive alcoholics, drug addicts, and thieves living in poverty. Our other neighbors are just normal clean-cut people like us. It’s probably just like your neighborhood really. Except people here don’t pretend as much. There is no dressing it up. We live in a big complex and our building happens to be closest to the dumpster. It’s convenient actually. Whenever the trash can is full I don’t have to far to go to dispose of it. Plus my kids love it when they can catch a glimpse of the enormous trash truck that picks up the larger than life Rumpke bins. They watch in amazement as the robotic vehicle hoists each metal box up in the air to dump out all of it junk and smash it down into bits. I’m thankful for the dumpsters. Of all the things I won’t miss about being in this place I’m going to miss the dumpster. I know that sounds strange. It’s ugly and it’s smelly, but God has used it to provide for our family in ways that are actually quite miraculous. I shared the story on Facebook the other day about how I had sorted through a bunch of clutter in my room and had separated what was left into three bags. I wanted a better storage system for my scarves, gloves, and winter hats, but I couldn’t come up with anything so I just put the items into plastic bags for the time. Later that night I saw these three bins sitting outside of one of the dumpsters. Two of them still had tags on them! Stuff like that isn’t that uncommon for me. 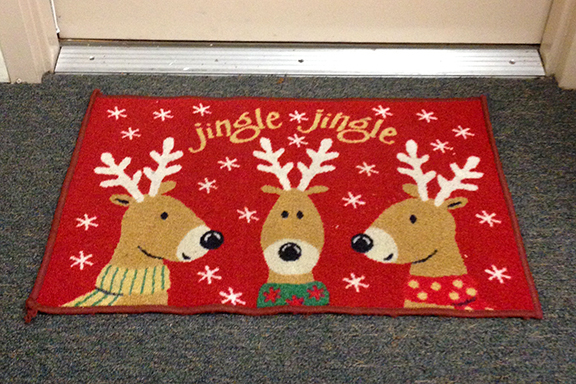 I really can’t remember all of the items I have found, but some things include Christmas decorations like this mat that I found at Christmas time when we didn’t have anything to decorate with. It certainly brought Holiday cheer to the kids faces each time they came home. 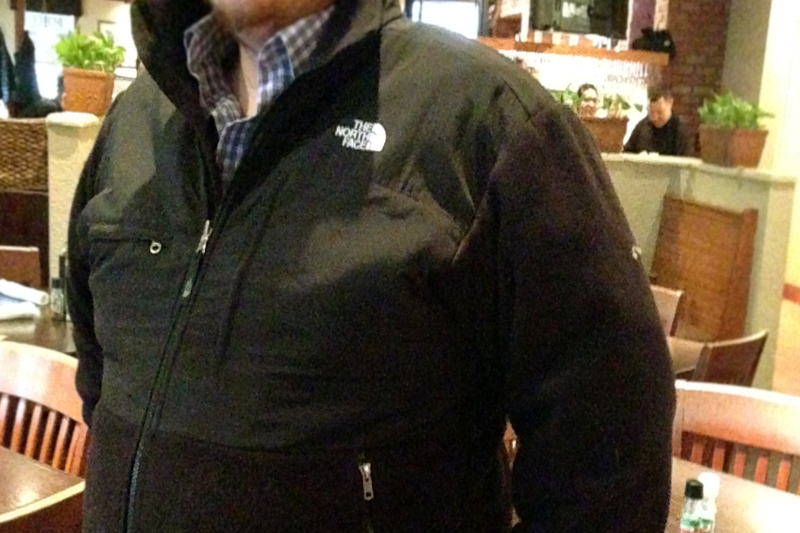 Or this North Face Jacket in perfect condition. 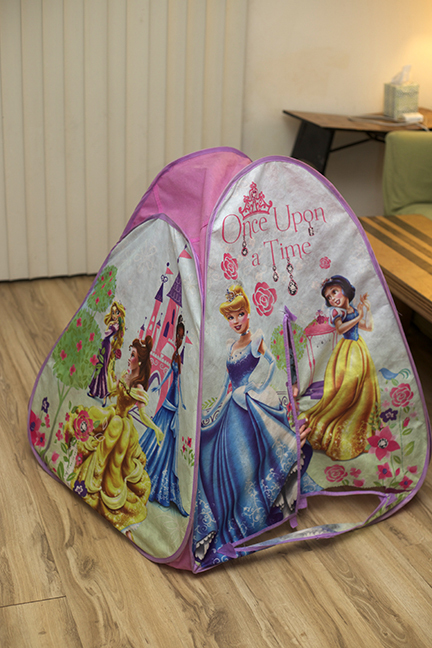 SJ loved it when I found this folding play hut. 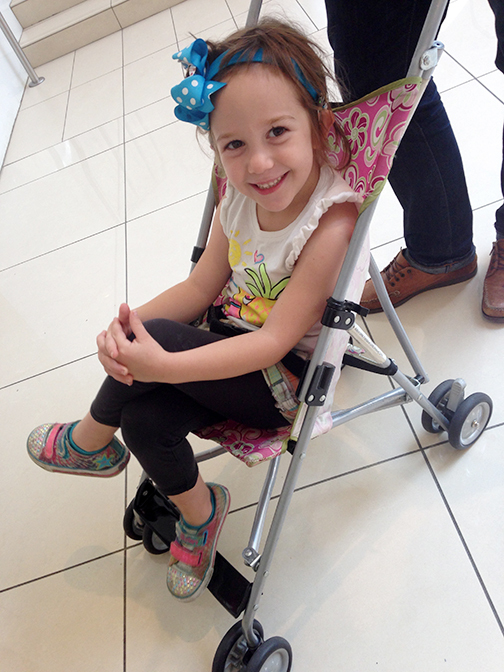 And then there is the umbrella stroller we have gotten so much use out of. That’s not even half of it. Most of the time the decent stuff is left outside of the dumpster, but every once in a while it’s actually inside, but sitting on top of the trash with a bunch of other home goods. For those worried about germs a little scrub down and some lysol is all you need and I have never taken anything that looked nasty or that was worthless to me. My friends have questioned me on why there is so much “nice” trash around and my theory is that some people are evicted or move in a hurry and when the clean up crew comes through they just throw everything out. Maybe some people purposefully leave stuff outside of the dumpster knowing that their trash will be a treasure picked up by someone else? You can try to explain it however you want, but the fact of the matter is I have collected a lot of useful things out of those dumpsters and I share this story as a testimony. In one of our lowest times God has provided in the most unlikely of ways. Even just little things. Why wouldn’t he? I mean when you think about some of the miracles in the Bible with pulling coins out of a fishes mouth, or spitting in the mud and putting it on a blind man’s eye? Yuck. Maybe God wants you to step out of your comfort zone and get a little bit dirty this week. Not just to do it for the heck of it, but out of obedience. Perhaps He wants you to seek him in some of those dark and smelly places where you usually don’t venture. It could be physical or it could be totally spiritual. I have no idea, but I do know that sometimes we miss out on the blessing because we are in our clean safe holy place. I am not convinced we need to stay there. In your own way and by His leading I challenge you to look for God in the dumpster. This is beautiful, perfect, and exactly what I needed to read this morning. This line, “but I do know that sometimes we miss out on the blessing because we are in our clean safe holy place. I am not convinced we need to stay there.” Yes, that. Thank you for that. Thank you for commenting Sara. 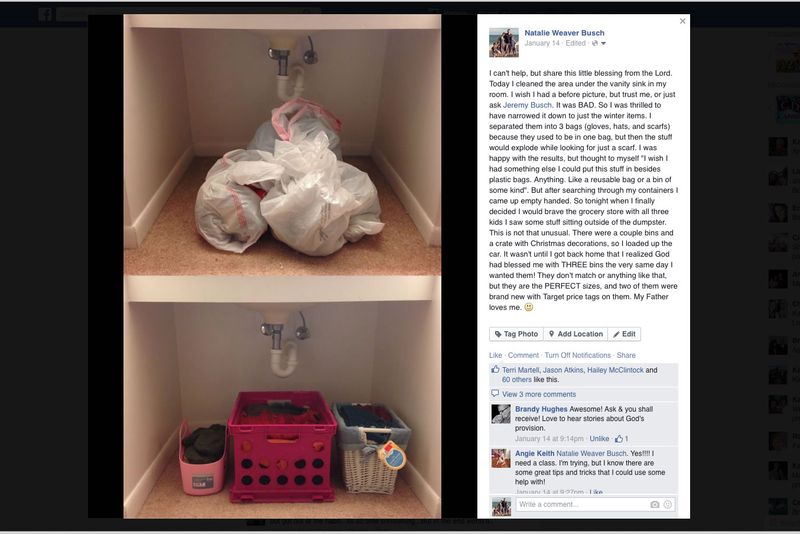 “A Holy Mess” and the “Messy Mom”. Thank God he works with the mess! I absolutely love this post, Natalie! God really does show up in the most unexpected places and I especially think he comes to those places we are least likely to go too. So much THIS: “Maybe God wants you to step out of your comfort zone and get a little bit dirty this week. Not just to do it for the heck of it, but out of obedience. Perhaps He wants you to seek him in some of those dark and smelly places where you usually don’t venture.” Amen and Amen! He is not to prideful to use a dumpster, and not ever limited by any circumstances to provide in our lives. I love how he works. Im in tears over here. He surprises me everyday. I just love this post may be one of my favorites so far. He is in every detail of our lives and cares about even the little things like a doormat! Love you sweet friend and I love His kindness he shows us. I have been blown away by His faithfulness! Thanks for your encouragement and I am so honored that you shared this Laura. Beautiful story of finding God everywhere and in everything. We can be too quick to judge the outer appearance of others without stopping to realize that they are a child of God as we are. I am glad you highlighted the dumpster outside your building today because the lesson was powerful. I’ve been sitting on this one for a while. I always thought it might “gross people out” if the knew I got stuff out of the dumpster, but like I said some of the ways God moves often does seem unclean. I can sooooo relate. I live in an apartment and look for goodies at the dumpster, too. I will have to write a post sometime about what I’ve found. I love your application and I will be looking for God in the “dumpster” this week. Really!? That is so awesome to know it’s not just me. I hope yo do write about it. I moved a couple months ago, but I can still find curb side discarded items from time to time. From one dumpster diver to another – I love my dumpster treasures. In fact just a couple of weeks ago I found something I’ve wanted a long time but could never justify the price. 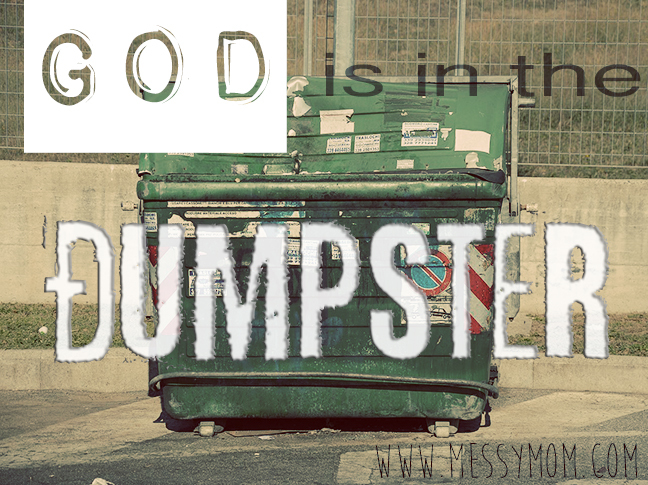 God is in the details….dumpsters – He will use just about anything to bless His kids! Here I was worried everyone would be disgusted by my collections (coming from the dumpster and all) but I have friends that do the same thing. YAY! God is so good. What a wonderful, thoughtful post. I agree, that God is everywhere even in the places we consider most dirty! We truly need to look around and open our eyes more often! Thank you so much for the encouragement! Awww, thanks Jess. I am glad we could connect on this blogging journey. You are such a thoughtful wonderful writing companion. People in my neighborhood will leave nicer items out the night before trash day. I bet you’re right about some of those items being left out intentionally. Whether intentional or not on their part, God is so good to provide for us in unexpected ways! You’ve heard and read about our times of His miraculous provision when we were in a similar season as yours. I love to read stories like this! Thanks friend 🙂 On more than one occasion I have actually found something that was thrown out and then sold it at a yard sale. Some people make thousands of dollars that way! I have read articles about it. Of course that is not my intention at all. I am just grateful for the reminders that God cares for his children and he speaks to us in such creative personal ways. I love this, Natalie! It’s amazing what people throw away–and how quirky God’s sense of humor is! I know! Like I said I mentioned a couple examples from the Bible, but I keep on think of more and more. He works in such mysterious ways. Beautiful reminder of God’s sweet provision through every season in our lives. It’s been quite a season! Sometimes I wonder when this time of transition will end, but He has taught me so much and already been using our story in ways I never imagined he would. I know in hindsight I’ll look back and see how he orchestrated it all! This is so good. I love how you used your experience to rely on God and trust in Him. I love, love, LOVE this. It’s so easy to stay in our clean, “holy,” EASY place. But God doesn’t need us in the places that are already clean. He needs us to go to work where it’s dirty. Natalie…not much to say except this openess God has gifted you with makes me cherish you even more as a friend. I love your heart, your faith, and your willingness to let God control the mess! I love this post!!!!! It’s so very true and thank you for the challenge. ? Thank you Paula. It’s a challenge for me as well.